Additive manufacturing, also known as 3D printing, has rewritten the rule book for modern design and engineering. 3D printed parts are durable and inexpensive at low volumes. They can achieve previously impossible complex geometries, and, unlike injection molded or machined parts, they do not require any tooling or other start-up expenses. Not only does this greatly reduce initial production costs, but it also allows for on-demand manufacturing that can begin almost as soon as an order is placed. Taken together, these advantages make smaller, highly customizable productions more practical than ever before. Though 3D printing has historically been used primarily for rapid prototyping, recent technological advances have made it equally viable for producing industrial-grade parts and polished final products for consumers. All these new advances require that we rethink the principles of design for manufacturing (DFM) from the ground up. The best practices for traditional manufacturing technologies do not apply directly to additive manufacturing, and, in fact, can often hold businesses back from getting the greatest value out of their 3D printing operations. As a result, most manufacturers are only just beginning to understand how to best incorporate these new technologies into their supply chain. The earlier in your product development that you start thinking about 3D printing, the more you will benefit from it. Often, when people consider 3D printing, they think about whether it would be more cost-effective when manufacturing the exact same part as they would produce with a traditional technology like injection molding or machining. While there are certainly situations where this approach can add value—often having to do with costs, order volume and production schedules—it is really only the first step when it comes to getting the most benefit from these new manufacturing technologies. This sort of economic analysis after the part has already been designed affords only a fraction of the total benefits that 3D printing has to offer. By developing products with 3D printing in mind from the start, designers and engineers can position themselves to take full advantage of all the benefits that 3D printing has to offer. Fully-realized DfAM practices will result in parts, products, and supply chains that look fundamentally different from their traditionally-manufactured counterparts. Design for additive manufacturing differs substantially from traditional design for manufacturing, both in terms of the technical possibilities afforded by 3D printing and the economics behind it. The first is that organic shapes can reduce part weight and volume while maintaining or improving mechanical strength. Because 3D printing allows for more fluid geometries, engineers can remove any material that is not essential to the function of the part. This reduces costs by minimizing the amount of material used and allowing more parts to fit into a single cycle of the 3D printer. Second, because parts are printed one layer at a time, large, flat surfaces are less durable when they fall into a single layer. To compensate, flat surfaces are often oriented vertically or diagonally within the printer to ensure that they are printed and cured in multiple layers. Changes in part orientation can also be used to achieve different levels of rigidity or flexible depending upon the mechanical requirements of the part. Moreover, because 3D printing can create hollow or nested geometries that would be impossible with injection molding or machining, it can create parts with latticed interior structures which greatly reduce part weight without reducing mechanical strength. Whereas traditional manufacturing would require multiple parts assembled at a later stage, this approach also allows complex shapes like cooling vents, nested cores or integrated wiring ports to be created in a single part. By manufacturing these components in a single piece, 3D printing opens up new design possibilities, creating stronger parts with more streamlined profiles and eliminating the time and cost of assembly. Many of the biggest differences between additive manufacturing and traditional technologies are rooted in the unique ability of additive manufacturing to produce virtually any shape at any time without additional tooling or setup costs. In traditional manufacturing, tooling and/or manual setup is required for each individual part in a production. Tooling is slow and expensive to produce, and, generally, each tool serves a single purpose. As a result, any given stage of the manufacturing process can only produce a single type of part. In order to reduce the cost per part of this expensive, single-purpose tooling, traditional manufacturing relies heavily on economies of scale. The more parts produced, the lower the cost per part. In contrast, 3D printing does not require any tooling at all. Instead, the cost per part of 3D printing is largely determined by how many parts can be produced in a single run of the printer. 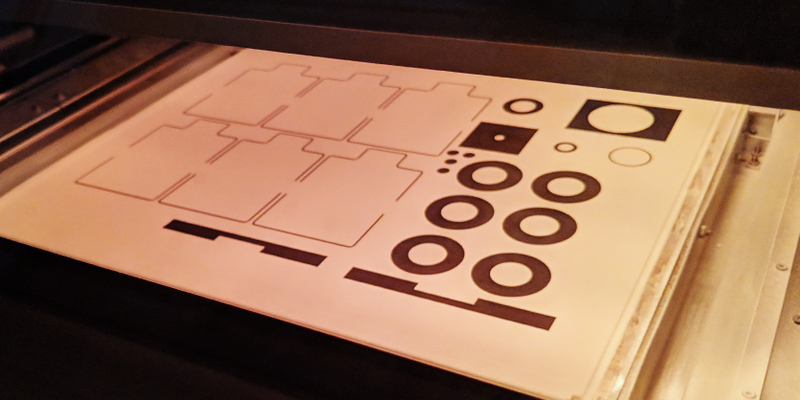 Because each printer’s bed is a fixed size, maximizing the available space with every run is one the keys to getting the lowest cost per part. This is referred to as build density. Build density is a major consideration when optimizing parts for 3D printing using DfAM. Taking the time to think about how parts will be oriented and arranged to fill the limited printer volume can reveal simple design changes that allow a few more parts to be produced by each build, thereby reducing part cost. Common techniques for maximizing build density include designing parts that tessellate in tight-fitting patterns or can be nested inside of each other. This also leads us to one of the essential economic considerations of 3D printing when compared to traditional technologies like injection molding. While injection molding starts out quite expensive, the cost per part decreases as the number of parts increases, up until the point when the tooling cost is spread across so many parts that its impact on part cost is negligible. This provides excellent value on large quantities of parts. 3D printing starts out significantly cheaper than injection molding for low numbers of parts. Cost per part continues to decrease until the printer bed is producing as many parts as it can fit in a single run. Once this point is reached, there is no longer additional savings on higher quantities of parts. This makes 3D printing a great option for small to medium runs when compared to the high cost per part of traditional manufacturing at these volumes. In the graph above, you can see that lower part volumes are far more expensive per unit when using traditional manufacturing, while 3D printing technologies are far less expensive. However, as the number of parts increase, traditional manufacturing eventually yields a lower cost per part. Of all the unique strengths of 3D printing, its ability to seamlessly manufacture many different parts in a single build cycle has perhaps some of the farthest-reaching and least-explored implications for manufacturers. Since traditional manufacturing relies heavily on producing large quantities of the same part at once—also known as homogeneous production—it is not surprising that designers and engineers are still figuring out how to best make use of this new production model. One promising approach takes its inspiration from a method called the kanban system, originally used by Japanese automotive manufacturers to ensure just-in-time production. True to its name, just-in-time production aims to manufacture each part right as it is needed for assembly, allowing for streamlined manufacturing and significant reductions in inventory cost. The kanban system is now being repurposed for 3D printing to produce complete assemblies with each build cycle while leaving no surplus parts. Unlike homogeneous manufacturing, which produces large quantities of the same part with each build and thus requires many builds to create a single assembly, the kanban system allows manufacturers to produce every part needed for a single final product in one build cycle. Depending upon the number and size of parts, this often means that a single build can produce multiple assemblies’ worth of parts. For example, HP uses its newest 3D printer, the Multi Jet Fusion, to manufacture many of its own parts. Each Multi Jet Fusion requires 80 3D printed parts in its assembly, which it produces using kanban builds. Each build cycle of the printer is able to produce 3 complete, 80-part assemblies, which HP refers to as kanbans. As a result, printing enough complete assemblies for 100 Multi Jet Fusion 3D printers only requires 37 build cycles. In contrast, homogeneously printing enough parts for the same number of printers would require 90 builds, a substantial increase in production time and cost. Not only that, but those 90 homogeneous builds would create a large surplus of tens of thousands of parts that would need to be stored and inventoried for future use. By embracing heterogeneous manufacturing, HP has been able to reduce costs and increase production speed with a system that would never have been possible without additive manufacturing. 3D printing benefits manufacturers throughout the life cycles of their products, whether by maximizing product development time with rapid prototyping, increasing speed to market or creating on-demand custom replacement parts for existing products. At its best, the versatile, streamlined production capability of additive manufacturing can lead to entirely new approaches to designing, manufacturing and selling products. RapidMade is the leading provider of custom 3D printing, design and engineering services for the Pacific Northwest and beyond. Our mission is to help you maximize your competitive advantage with manufacturing services tailored to your specific needs. If you’d like to learn more about how additive manufacturing can benefit your business, check out our full list 3D printing services or contact us today. If you have a project in mind, get a quote and design analysis in 24 hours or less by clicking below!